How different are High German and the everyday language of the Amish*, Pennsylvania German (aka Pennsylvania Dutch)? In today’s video, a High German speaker converses with three Amish people – first Menno Petersheim of Shipshewana, IN, then Ivan and Ruth Chupp of Burr Oak, MI. You can see how well they are able to understand one another, and follow along thanks to the English subtitles. While growing up in the Midwest, I would see the Amish now and again. I was under the preconceived notion that they were standoffish, but I never really tried to talk with them. In August 2015, I met with the Amish to see if we could understand each other’s German; I speak High German, the form spoken by most in Germany, and they speak a mixture of an old dialect of German or Swiss German with many English words thrown in. I was not allowed to film them – just record their voices. I have included pictures that I found online, with the exception of the first four in the second conversation with Ivan and Ruth Chupp, which are pictures taken during the visit. You can see what their store looks like and what they sell. Although we could understand each other relatively well, the conversation was not always easy. I have added subtitles for what I can understand. Otherwise, you will see question marks. Even if you know nothing of German you can see that there are distinct differences between the speech here, and some trouble understanding at points. The Amish do have a command of High German as this is the language of church, so that must have helped the flow of talk here. You’ll also hear some English words in the mix from the Amish speakers, as is typical. *The everyday Amish tongue varies as well across regions (e.g., in Lancaster County vs. the Midwest), and a minority of Amish – the “Swiss” Amish – speak a different variety of German which can be difficult for other Amish to understand. The first minute in this video is quite humorous. The German speaker is on one level, and the Amish man is on another level. Both are trying to figure out what the other is saying, but there was enough connection in the communication that things kept going, LOL. I had more fun with the first character because he had more Pennsylvania Dutch in his conversation. The second group had quite a bit of English in it. By age nine, I was practically fluent in spoken English, and so by age 10, I would have been conversationally bi-lingual in two languages. But, at age 42, I’ve lost so much Pennsylvania Dutch, I don’t know how to say where I’m at with Pennsylvania Dutch. When I listen to Pennsylvania Dutch from a new area, there are a number of difficulties. For example, back about 7 years, I was in Pennsylvania, and I ran into an Amish man. When he asked me what my name was, he didn’t say it how Pennsylvania Dutch would sound in Fredericktown, Ohio, and so, I didn’t know at all what he was asking me. Then, he reverts to English, and it looked like I didn’t understand Pennsylvania Dutch. Most of the time, the different areas of Amish in America just say words differently, as opposed to having new grammar, but that Amish man in Pennsylvania took me for a loop. In 2005, I visited the Amish church that we went to back there in the early 80’s. Wow, so much of that preaching just flew right by. I could follow the first preacher easier, and then a preacher from another area preached and I probably missed most of what he said. 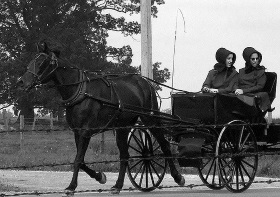 Amish formal education is abbreviated compared to standard American learning. But the Amish do have one thing most Americans don’t – a command of multiple languages. The estimated percentage of people in the US who are bilingual is around just 20%. If you add High German, this gives the Amish a third language. Thank you for sharing this video. Knowing some of both languages, I could follow along, but I noticed there was a mistake in the translation around the Amish word “Leicht,” which means “funeral” in his language, but “easy” in High German. The word easy is in the subtitles, and it shouldn’t be. The Amish man was bringing up how the communities come together for funerals, but it has nothing to do with the High German meaning for Leicht. Btw I’m curious if you’ve heard much of what Swiss Amish speak, and if so how well you are able to follow along? Dem Nicht-Amischen ist Deutsch in der Schule beigebracht worden, oder? Seine Muttersprache ist Deutsch gewiss nicht. Wennschon, hätte er nie die Amischen gesiezt (mit Sie angeredet). Solch eine Höflichkeitsfloskel ist den Amischen völlig fremd, wenn ich mich nicht irre. Jedenfalls bedanke ich mich bei Frau Furlong. Ich habe das mit dem Nickerchen (eine kurze Zeit, das Bett noch zu hüten, trotz des Weckers!) nicht verstanden. Aber was soll’s. Danke, Erik, dass Du uns dieses Video mitgeteilt hast! This word has nothing to do with easy. Die Leiche is High German for corpse. It takes little in the way of imagination to see how one thing led to another. It could be that the Amish wanted an expression that was not from the Roman Catholic tradition (die Trauermesse) or the Lutheran and Reformed parlance (der Trauergottesdienst). Or it could be a simple Ableitung or expression someone just happened to use based on die Leiche, and it stuck. Danke bestens, Erik, dass du das Video mit uns geteilt hast!!! Wow! So many English words interspersed in there. And I almost felt a hesitance with the Penn German speakers. They would quickly slip into English halfway through the interview. (I wonder if that is because it is more automatic when dealing with non-Amish people to just speak English). This was VERY interesting for me. I’ve been studying Penn German for a year now – and had not realized the dialects could be quite so varied and quite so many. I really enjoyed this. I wish there were more videos of this kind. By the way – when exactly do the Amish speak Hoch Deutsch, if ever? Is it only at the Church services? When they pray at home, do they read the Bible in High German out loud? At Horse Progress Days 2016, in Howe, Indiana, I witnessed something similar. There was an international guest from Germany named Gunther something that I happened upon. I had his business card, but have misplaced it so I don’t know his last name. He spoke next to no English, which is where I am with German … high, standard or otherwise. At one point he was trying to tell me something, but I was clueless as to what he talking about. So I asked 3 Amish men that were standing together if they could translate what he was saying. They tried and tried, but clearly couldn’t do it. Then a 4th walked up, listened for a minute and then began conversing with Gunther. He was easily able to translate for us. I have no idea why it was so easy for him, but not the other 3 unless they just weren’t as fluent in standard German as he was. I really enjoyed the video. I learned the Schwabisch dialect of German 45 years ago when I was stationed near Heilbronn. My vocabulary knowledge was and is limited but I could follow some of the PA Dutch and the Hoch Deutsch (the subtitles helped). My family came from the Rhein-Pfalz in Germany to NY in 1710.